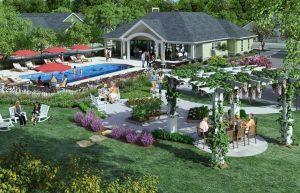 Baby Boomers fueling Real Estate Boom in Chesterfield! The future Clubhouse coming to The Villas at Ashlake! It’s no secret that the Baby Boomers have been influencing trends for decades. What’s interesting now is that they’re reshaping entire communities as they retire! A recent article in the Chesterfield Observer tracked how the wave of 55 and up homebuyers is reconfiguring local suburbs, from the arrival of active adult communities – like Cornerstone’s Villas at Ashlake – to the construction of outpatient health centers and shopping centers. What’s fueling this building boom? Now that Boomers are recouping their losses from the recession, they are able to tap into the equity in their larger homes and can afford to buy new low-maintenance homes in communities such as Villas at Ashlake. Developers are building homes – and doctor’s offices and retail outlets – as fast as they can to keep up with demand. In some cases, they are creating “mixed-use” projects, combining housing with offices and shops, to appeal to seniors al as millennials. It’s a thought-provoking look at how Baby Boomers continue to wield influence – and change lifestyles – even in heir golden years!